Today is my second day at sea and I can finally walk to various places on the ship in less time. I have found sleeping on the ship to be very easy as the ship rocks back and forth. I really enjoy being at sea; it is very tranquil at times and I am not rushed to go anywhere except my assigned duty locations. 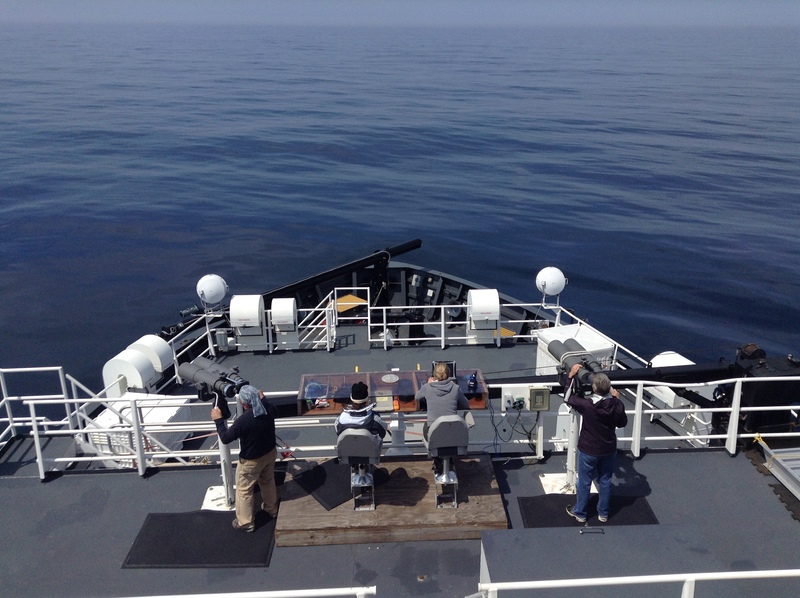 While on deck observing, the sights and smell of the ocean invokes memories of my former home in Bar Harbor, Maine. After a full day of observing whales in the sunshine I was very excited to conduct some star-gazing at night. At 2200, as I opened the first hatch outside, I walked into a wall of fog and was reminded quickly that I am miles offshore on Georges Bank in June! Sighting whales yesterday was very slow, but today made up for it. The weather was perfect, as the sky was mostly sunny with few high cirrus clouds early. Today I was assigned to the Flying Bridge for observations all day. There are three stations and we rotate every thirty minutes. The stations are Big Eyes on port and starboard sides and a computer in the center for data entry. We use different terms for orientation on the ship. For instance, the front of the ship is called the bow. While facing the bow, the left side is called the port and the right side starboard. My rotation began on the port side of the ship using the “Big Eyes”. After a half hour, your eyes become tired, strained and shifting to the computer to enter whale sighting helps. At the computer we enter whale sighting data called out by observers. Looking through the “Big Eyes”. Do you see anything? In addition to recording the identification of animals; other important attributes are called out by the observers such as bearings and direction headings. Looking through the “big eyes”, a range finder is located from center with a scale from 0 – 24, and is called the reticle. To properly calculate distance, the observer needs to adjust the “Big Eyes” to align zero with the ocean horizon. This is very difficult since the ship is always in motion. The “Big Eyes” in the image above is not correctly aligned. There is a chart we used to translate the reticle values to distance. 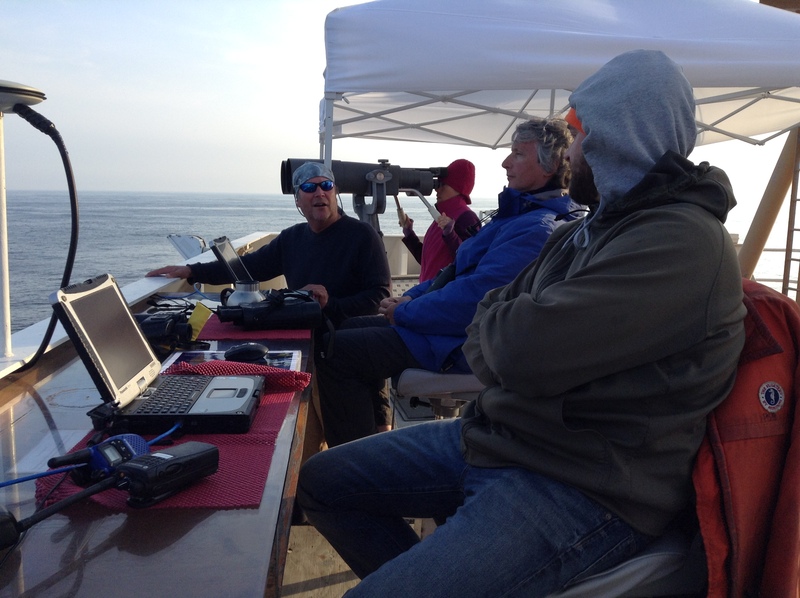 An early morning break was followed by an amazing hour of multiple whale sightings. 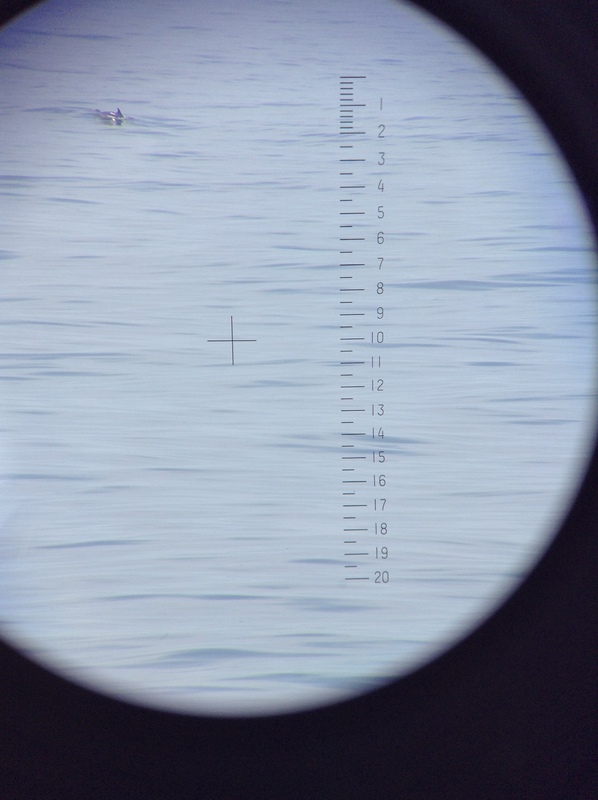 Fin, humpback whales and pods of Atlantic white-sided dolphin sightings were all around the ship. One humpback whale came within twenty feet of the boat. The afternoon was less active but we tracked pilot whales later which were not seen during morning rotations. This entry was posted in 2015, NOAA Fisheries Service, NOAA Teacher at Sea, Tom Savage and tagged big eyes, Georges Bank, viewfinder, whales. Bookmark the permalink. Sounds like an exciting morning, Tom! Especially seeing the humpback so close!